Dating back to the 11th century (impressive, right? ), the Karambit knife sure looks a lot like the claws of a big cat (tiger). As a matter of fact, if there’s one thing to notice on a Karambit knife it’s the special appearance. This special knife’s look does stay with you, but it far more than meets the eye. 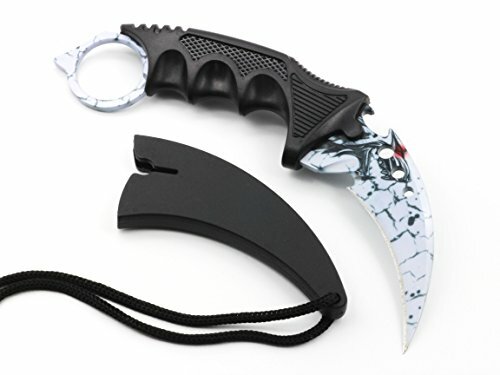 Highly popular for Asian people (Japanese like it a lot), the affordable Karambit is a utility blade designed for self-defense, accuracy and efficiency. There are three essential elements that ensure the Karambit’s performance: the hooked/curved blade, the ergonomic handle and the safety ring (it should have at least one). A good Karambit knife feels comfortable in your hand and its hooking ability allows you to get control over your attacker in case of an ambush. Even though the safety ring wasn’t a main feature of the traditional Karambit knife, the safety ring is now fundamental. It’s placed at the end of the handle and it helps you to insert one finger before placing the knife in your hand. This way, the knife isn’t going to slide back through your hand during a job with weird angles. The steel used on the Karambit knife is one of the first things to check when buying. A high carbon plain steel is a better option for a fixed blade Karambit, but a stainless steel one takes the corrosion a lot better. In the case of folding Karambit, the stainless steel would be better than the high carbon plain steel. 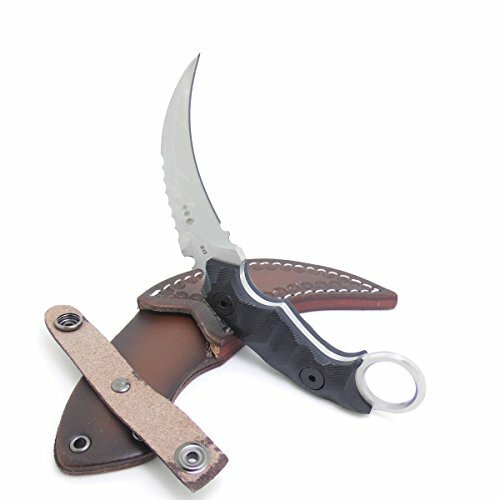 Most fixed blade Karambits are good for both offensive and defensive fighting knives, whereas the folding ones are good as EDC utility knives. The length of the blade is going to count on the mobility and access to the blade so make sure you choose wise. The Rockwell hardness tells you how easy it’s going to be to sharpen the blade and how well the blade is going to hold an edge. Take a look at the Rockwell C scale (HRC)- the lower it is, the easier it’s going to be for you to sharpen it and the tougher the steel is going to be. A higher grade means that the blade is going to hold an edge, but it’s not going to be easy to sharpen the blade. Do you want a plain edge, a partially serrated edge or a fully serrated edge? Each of the type comes with its ups and downs. For instance, a plain edge ensures a smooth cut and it’s easy to sharpen, but it may not lacerate as deep as serrated edges. You should know the difference between the Liner Locks and Piston Locks, Mid locks and Back locks. 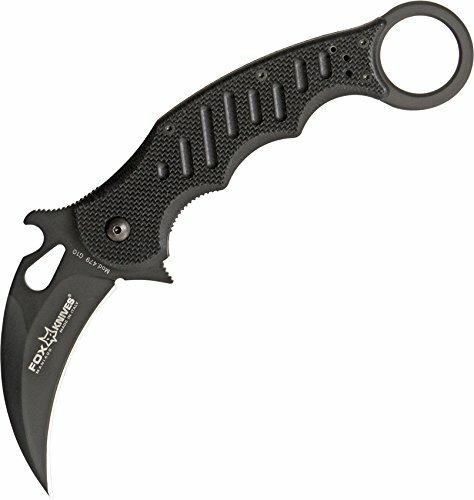 In a nutshell, there is a great variety of locking mechanisms so you should know what you need on your Karambit knife. If you’re going with a folding knife, keep in mind that there are 3 types of opening mechanisms: Manual, assisted opening and automatic opening mechanisms. Even if the Manual opening mechanisms are the most popular, the Assisted type are also winning popularity as they’re really comfortable. 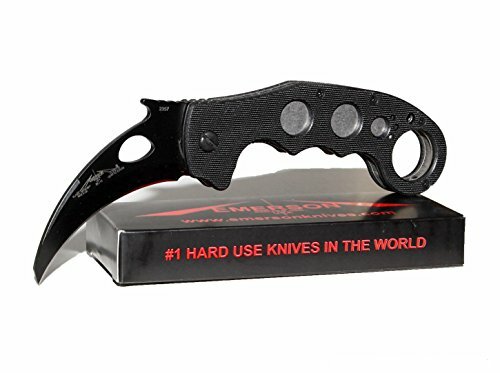 The karambit knife is legal almost everywhere in the world and it’s a fighting knife that may still be use for its utility initial purpose. The variety of colors, designs, locking mechanisms is impressive so take your time when shopping. 1). 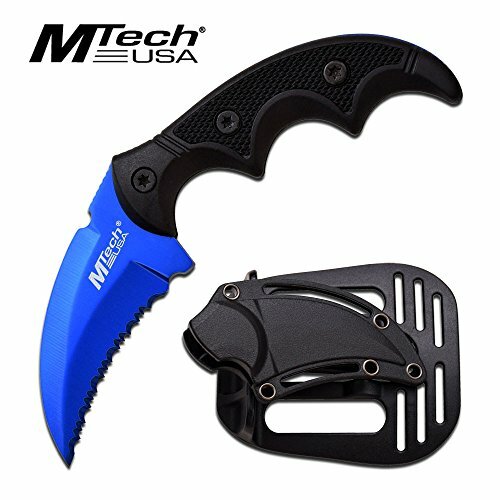 When you’re going shopping on a tight budget, the Vulcan Gear Tactical Hawkbill Karambit Knife with Sheath and Cord is going to be a sure buy as its price isn’t the only good thing it brings to the table. 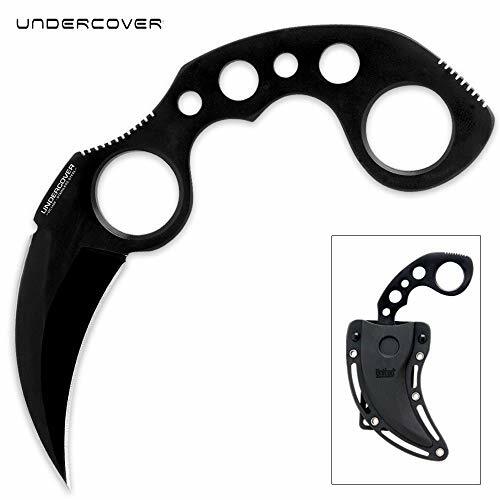 The tactical Karambit knife has a 4” stainless steel blade which is sharpened on one side. It has a 7.5” overall length and it’s comfortable and easy to use. The grip has an ergonomic design and the knife provides different areas for your fingers. It features a sturdy protrusion ring for your index finger and has a light balance feel. The blade is fixes and has a razor edge covering 95% of the interior blade length. The handle is firm rubber, which explains the non-slip grip. The knife comes with a protective cover and rope so that you may wear it around your neck. Affordable and good value for the price, the knife is a solid choice for the collector or the survivalist. All in all, for the good design, build and performance, the knife is a great choice and the rock bottom price is going to seal the deal for many. 2). The MTECH USA Fixed Blade Tactical Knife G10 Texture Handle is a great surprise for the buck you’re paying and scroll down for the details. The knife is only 5” overall and comes with a 2”3 mm thick blade. The blade is made of stainless steel and it’s serrated and sharp, resisting to rust. It’s a fully serrated electroplated blade that is going to take the use for a good amount of time. The matter aluminum handle features a G10 texture and ensures a good grip. The knife fits right in your hand and it’s both small and nice looking. The knife comes in a plastic sheath and fits snuggly in it, with no risk for accidental fall. The belt sheath has positive retention and seems to be well made. The packaging is subtle, neat and compact and the knife is well made and easy to use. Beggars cannot be choosers and the knife is a solid option, despite its low price. 3). 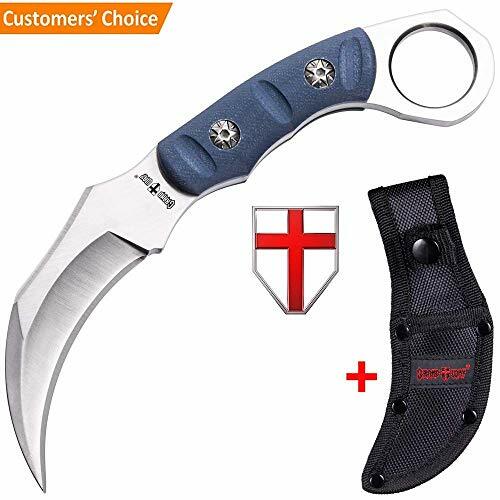 Don’t let the price of Karambit Knife Stainless Steel Fixed Blade Tactical Knife mislead you as the knife comes loaded with plenty of good things and only few inherent flaws. Lightweight and easy to carry around, the knife comes with a stainless steel blade which is sharp, wearable and resistant to rust. The blade is going to maintain its edge and the knife makes a great choice for many situations. You can take it when hunting, fishing, camping or doing other outdoor activities. The knife has an ergonomically designed handle, ensuring a good balance and feel. It has a stainless steel handle with a plastic cover which improves the grip and expands its use. As a matter of fact, the knife is very well made and has a durability feel to it. You don’t need to worry about carrying it around as the knife also comes with a sheath and cord for more portability and protection. Compact, cheap, sharp and really solid, the knife is going to get you out of many situations for quite some time. Regardless of the minor issues, for the many good things that come along, you shouldn’t hesitate and give it a go with this one. 4). 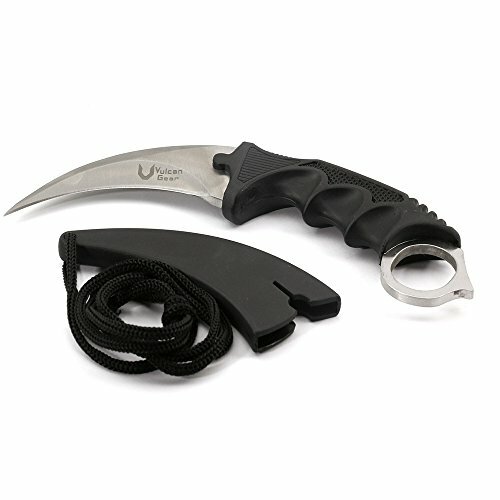 Made from just one tough piece of 420 stainless steel, the United Cutlery UC1466B Undercover Karambit Knife with Sheath is just the right choice for the entry level user. The knife has a good size for a comfortable feel in the hand and finger holes which ensure a better grip. This way, no matter if you’re holding the blade down from the fist or extended from the top of your hand, you’re going to have a good hold of the knife. The 3 5/16” blade is doubled edged and really sharp. It has full double edge on both sides and sharpening the blade is going to be fairly easy. The knife has a slim profile and fits great in the hand. It’s easy to conceal and carry and its holster comes with waist band clip. The sheath has a long lasting feel to it and it’s an impact-resistant ABS sheath. If you’re new at tactical weapons and you’re trying to learn before you start running, this one may be the winning choice for you. 5). The Micarta handle of the Grand Way Karambit Claw Knife is the main asset, but the knife does come with plenty other good things. The knife comes with a smoothly polished blade made of steel 440C. it’s a balanced composition of the steel, which sustains a long time use without needing to sharpen the blade. In addition, the blade is resistant to rust and it’s durable, presenting a high factory sharpening. The beautiful and special design are also going to make a nice impression. The knife has a ring at the end of its handle, for easier forward and reverse grip. The ring is wide so you may use the knife when wearing gloves as well. The handle is made with Mikarta which consists of polymer film, glued with various materials from the same class of laminates. Mikarta presents resistance to mechanical processing, but also to water and temperature changes. It doesn’t absorb odors and doesn’t slide/rotate in your hand even if the surface gets wet. The pads are smooth and warm to touch, nonskid in the hand. Lightweight and easy to conceal, the knife is great for fast maneuvering. It’s easy to adjust and holds a decent edge. Even if the knife isn’t all roses and rainbows, it’s lightweight, easy to use, dependable and comes with a Mikarta handle. Why miss it? 6). When it comes to MASALONG Outdoor Survival claw Tactical Teeth Knife, its popularity speaks volumes so you shouldn’t worry about taking a stab in the dark with it. However, there are way too many good things that are worth talking about. The knife comes with a D2 steel blade which presents a 58-60HRC hardness. The surface is going to take the sanding and stone wash for a good amount of time. The blade is sharp and it’s going to stay that way even when using it on a regular basis. The knife is well made and has a good heft to it. It has a nice balance to it and feels nice in the hand, easing the use. The craftsmanship is amazing and the knife stands out with the perfect blade curvature, both in the back teeth and back arc. You may confidently use it in any fighting condition, from any angle. It’s a great knife for tactical use. You may choose from the leather or the Kydex sheath. Either way, the sheath ensures a tight fit so the knife isn’t going to fall by accident. By anything, it’s going to be a bit tricky to draw if from the sheath (so fast drawing isn’t a sure thing). The sheath is adjustable and you may switch from left to right hand straps. The grip is good and the knife has a solid build. The good outweighs the bad in this case as the knife is reliable, sharp and great for tactical use any given day. 7). Made with high quality materials, the Fox Knives – Oreste Frati SRL 9001502 Karambit Fine Edge Folding Knife is never going do a number on you. The knife comes with NC690Co stainless steel blade and it’s really sharp. Its end finger ring is large and the knife is a good option for a large hand as well. The liners are solid and the knife comes with a clip, for easier use. The G-10 handle ensures a steady grip and the lock is really sturdy. The blade deployment is good, even if it’s going to take you a while until you learn how to do it easier and faster. It’s a folding knife ready to take the use for a very long time. It comes in a sealed Fox Box and is in for the long run. 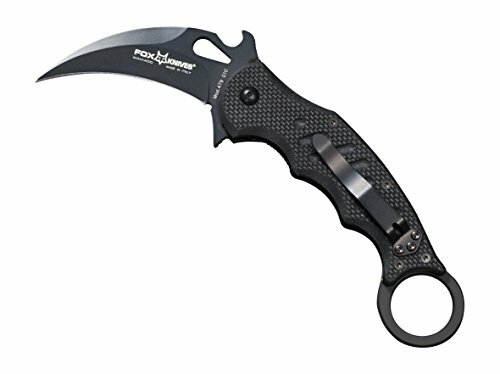 No matter the minor issues, hands down for Fox for creating yet another reliable, strong and high quality karambit knife. 8). Loaded with good things, the Fox 479 G10 Emerson Wave Karambit is one karambit knife that you shouldn’t skip on when shopping. Featuring the patented Emerson Wave, the knife is easy to use and allows fast deployment of the blade. It comes with a tiger claw shaped blade which is 3in long. The blade has black Teflon coating which explains the sharp tip and the increased edge renetion. The design is well thought out and the knife comes with an adjustable pocket clip for easy ambidextrous use. The retention ring is sustaining a secure and good grip of the knife. The knife has a good balance to it and stays with you with its sleek profile and nice appearance. Made with the highest quality NC690Co stainless steel, the blade of the knife comes with fine and consistent edge, which is also resistant to corrosion. The blade is sharp and knife is solid for EDC use. Regardless of the minor issues, for the great design and performance, the knife is always money well spent. 9). 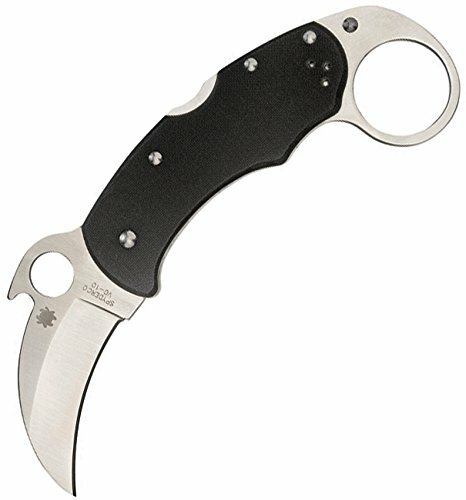 If you’re willing to pay the high dollar and get a karambit knife that is going to last for a long time, you should take the leap of faith with the Spyderco C170GP Karahawk Plain Edge Knife. Designed by Spyderco founder, Sal Glesser, this one makes a nice impression with the gently curved blade made from VG-10 stainless steel. The blade is sharp and keeps a nice edge even in case of intense use. The knife features the famous Round Hole and the Emerson Opening Feature which is going to provide positive and swift deployment every time. The high-strength back lock mechanism is going to take the stress of defensive use, whereas the handle is made with skeletonized stainless steel liner. The textured G-10 scales add to the list of features too. The handle comes with a ring at the end so that it eases the classical karambit use. It’s also sustaining the amazing compact profile for easy carrying. In addition, the knife comes with reversible hourglass clip which is going to sustain tip-up standard grip and reverse grip carry both sides of the knife’s body. Comfortable, safe and sharp, the knife is a durable option for EDC. As long as you’re focusing on the goods, you shouldn’t have a second thought when buying as this knife is going to get you through thick and thin, every single time. 10). 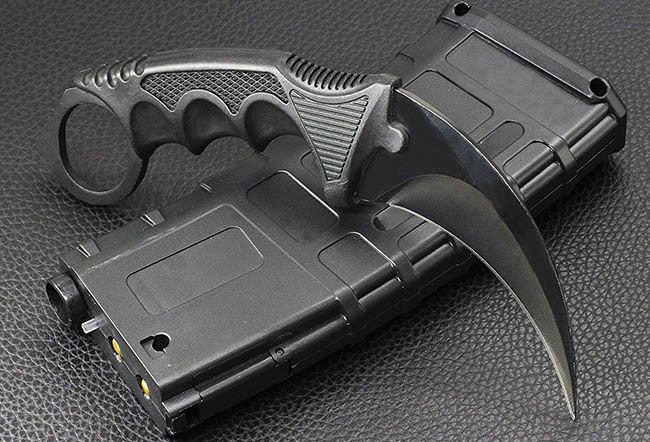 Made in our USA, the Emerson Knives – Folding Karambits is truly the karambit option for the experienced survivalist. The knife stands out with its G10 grip, titanium liners and lock. The steel blade is sharp and this is one knife to use on your combat mission, when going for a kill. The list of impressive features continues with the patented “wave shaped opening feature” or the remote pocket opener. Should your life be in danger, you may open the knife with just one hand. The reinforced tip design strengthens the point, reducing the risk for damage. The knife comes with threaded standoffs and not solid backs spacer. This means that the knife is lighter than previous models, especial in the ring area. Well-made and ready to take some difficult jobs for a long time, the knife is an investment for the long run. All in all, as long as you know your business when it comes to karambit knives, you shouldn’t hesitate and put your money at stake with this one.